I’m actually not much of a baker, and don’t have a sweet tooth, which is why you see far more savory recipes on the site. 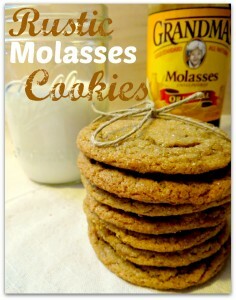 But when I do crave dessert, I prefer something like these molasses cookies. The rich spicy flavor and chewy texture keep me going back for more. Give me a plate of these with a glass of milk, and I’m a happy girl! Despite being rolled in sugar before baking, they’re not overly sweet. This recipe calls for a healthy amount of ginger, cinnamon, and ground cloves, which give them a spiciness that’s just delicious. They’re a lot like gingersnaps, but more chewy with some extra spices! Be sure to not over-bake these or they won’t be chewy. Oven temperatures can vary greatly, so I advise you to test one cookie first. Let the cookie cool, taste it, and adjust the cooking time accordingly. You want to take them out when you see cracks around the edges. The center will look a little undercooked, but they firm up when cooled. Here’s a tip: When storing these, add a piece of bread to keep them moist! Enjoy! In a medium bowl, mix together the butter, 1 cup sugar, and egg until smooth. Stir in the molasses and vanilla and wisk together. In a separate bowl, combine the flour, baking soda, salt, cinnamon, cloves and ginger. Mix the dry and wet ingredients until just combined. Roll each ball in the remaining ½ cup white sugar. Makes up to 5 dozen. Looks like an easy recipe to follow.. I like these kinds of cookies! Those look and sound amazing! I’m going to try some this weekend! Molasses cookies are one of my favorites. They remind me of my Gram. This recipe looks amazing! These sound really good! I love molasses but hardly ever think to make anything with it.